Heat oven to 350°F. Spray 11x7-inch (2-quart) glass baking dish or shallow 2-quart casserole with cooking spray. In large bowl, stir topping ingredients until smooth; set aside. In 2-quart saucepan, melt butter over medium heat. Stir in remaining fruit mixture ingredients. Cook about 2 minutes, stirring frequently, until mixture is hot. Spoon fruit mixture into dish. Pour topping evenly over fruit. Bake 45 to 50 minutes or until golden brown and toothpick inserted in center comes out clean. Cool about 20 minutes before serving. Serve warm with whipped topping or ice cream. Sprinkle decorator sugar crystals over the cobbler dough just before baking. Instead of the whipped cream, try creamy Yoplait® vanilla or plain yogurt. Grill Directions: Heat gas or charcoal grill. Make topping as directed in step 1. Place butter in 10-inch cast iron skillet; place skillet on grill over medium heat until butter is melted. Stir in 1/2 cup sugar. 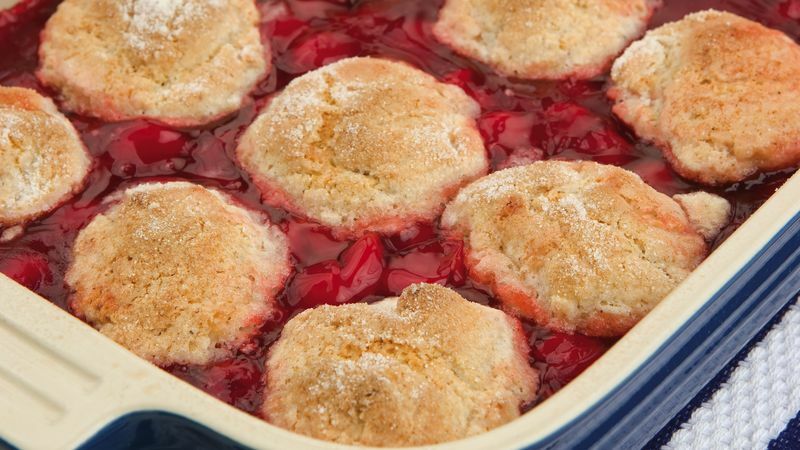 When sugar mixture begins to bubble, stir in pie filling and cherries. Cook and stir until mixture is hot. Spoon topping over fruit mixture. Cover grill; cook 20 to 30 minutes or until golden brown and toothpick inserted in center comes out clean.